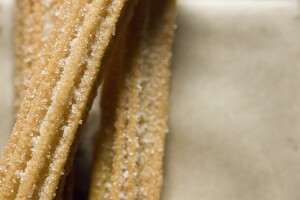 Graduating seniors at UC Berkeley, go get your free churros on Sproul Plaza, today, March 9 from 11:00- 2:00. Maybe these warm, sugary treats will make you feel a little less bummed about leaving this precious school of ours. Maybe it will make you even more excited. Either way, do not miss an opportunity to indulge your sweet tooth! The word “free” sounds good, right? Well, there is more. If you are a dedicated foodie, you can tune out now. With your churros, get a free class of 2011 keychain, and get entered into one of those one in a million winner raffles. Also stop by for information on graduation. However, do not forget the main purpose behind this giveaway (because we all know everyone has an ulterior motive. Pessimistic much?) This event is a part of the Senior Gift Campaign, a tradition in which Seniors are encouraged to donate to the school before they leave. This year’s class goal is 100,000. A little give and take (or just take) can’t hurt!